Rick Adelman’s job just got tougher…a lot tougher. Yes, you heard me right. The addition of Yao Ming doesn’t make Adelman’s job easy as coach of the Rockets. It does the opposite. One of the most difficult things a NBA head coach has to do is design rotations. For those newbies out there, rotations means dividing up the players’ minutes played per game, and in the process creating a flow and chemistry amongst those players on the floor. Ideally, your starters play the first nine minutes of the first quarter, give way to the bench until about the nine minute mark in the second quarter, and finish it off from there. And that rotation continues throughout the game with some adjustments depending on the score situation down the stretch. For Adelman, this job would have been difficult as it is. Seriously, look at the roster and how many minutes are going to have to be divvied up amongst the Rockets. Talent and depth certainly won’t be Houston’s issue this season. That’s a good looking roster with lots of versatility and scoring options. But in the NBA, it’s about building chemistry and playing as a team. And juggling lineups and roles non-stop not only hurts that, but it drives players nuts. In addition to figuring out that roster rotation, you know throw in this: Yao Ming is on a 24 minutes limit for what sounds like the entire season. No matter what, the “Great Wall” will only play 24 minutes in a game. Down two points in the fourth quarter will he stay in the game? Nope. So that presents a tough problem for Adelman – how do you divide the minutes amongst the big men? And who do you run the offense through? There are plenty of options. 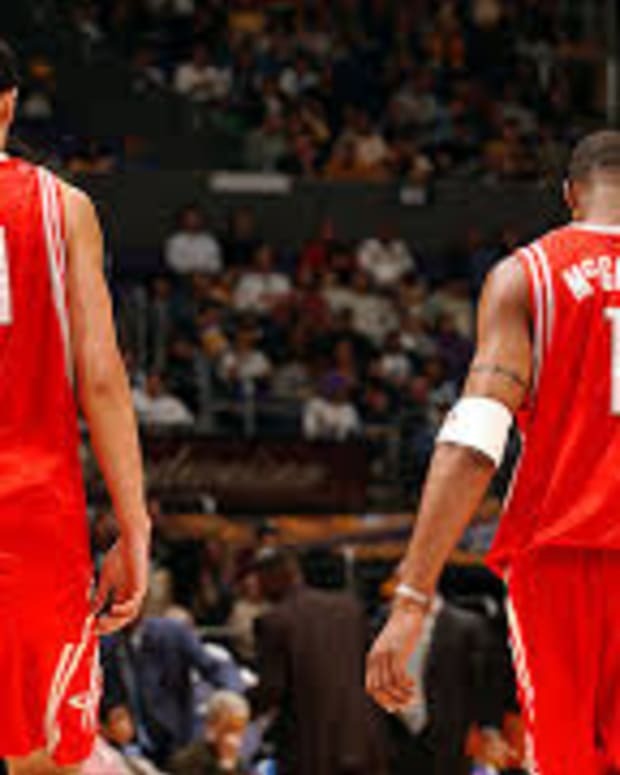 But does Adelman run the sets through Yao when he’s on the floor? You would certainly think so because when the big fella is healthy, he’s the best scoring center in basketball. But that presents this problem – how does your team adjust to life without Yao and how does the team adjust to the sporadic minutes? It’s not hard to see what problems this can present. And if you thought Adelman had to do a great job with last year’s group to earn his paycheck, this year’s chore will be even tougher. Last season, the problem was there weren’t any scoring options to choose from. Now, there are almost too many. Good luck, Rick. Rockets fans hope you have the magic formula.